So have you seen Mike McCafferty’s Fed Ex commercial yet? If not, take a look. It’s pretty funny! Paul Ben-Victor’s cousin, Rob Novak, produced this fun little short. Paul would love to see it get 100,000 hits. So watch and share! Julie Ben-Victor is asking that her video be shared. She wants to reach over 10,000 views. So I answered the call and am sharing this with all of you! Watch it, share it, and be in awe of Julie’s talented face! Sometimes life can take unexpected twists and turns and that can especially be said about the film development process. Back in January I told you that I was going to start writing a story reference guide (also called a story bible). I estimated that I could get it done in a couple of weeks. What I didn’t imagine is that I would still be writing it ten months later. Boy, was my estimate off! See, what I didn’t count on was getting into a seven-car pileup in February. I couldn’t have imagined back then how much that would affect my life. I know I already mentioned this back in March, but while the pain was starting to decrease, I didn’t know then that my sleep issues would continue all the way into July. I’ve had six long months of feeling like a zombie. Yeah, I felt like the walking dead…barely able to function and stay awake during the day because of being unable to stay asleep at night. Let me tell you, being a zombie is highly overrated. I don’t recommend it. Needless to say, the film project came to a screeching halt. I managed to attend some cool workshops and meetings, but that’s about it. I can’t tell you how frustrated that made me feel. But that was then and now I’m relieved to be feeling much better, and my energy is returning. I’m getting back on track with the project. Finally! So let me catch you up on what’s going on. I’m working on the story bible again and have most of the character bios and psuedoscience done. As I make progress with it I’m seeing things that need be fixed in the treatment, so we’ll need to give the treatment another once over before it goes to the story analyst. I’m also working on something that will involve all of you—a contest! Yep, I’ve got a cool little contest coming that I think you will like. It involves you getting to name some of the characters in the movie! Australian fan Kristy Seddon has created some darling artwork for the contest that I can’t wait to show you. I’m editing the contest rules and my lawyer is just about finished with the Terms and Conditions section. After I review everything and make sure that everything is correct, I’ll be posting it up on the blog. So put your thinking cap on and start thinking of names! As of the date of this posting, there are 16 people so far who want to see another I-Manicon happen. One of them is Mike McCafferty (Eberts). Mike wants to see another I-Manicon happen! How about you? If you support this idea, please go to the I-Manicon 2011 Facebook Page and hit the “Like” button. Okay, I know the economy is tough right now, but I think we can do better than 16 people! I have a series of articles coming up that I’m going to be writing for the United Filmmakers Association. I’m going to be interviewing distribution companies. This was supposed to start this month but, tragically, one of the sweetest little cats in the world fell ill and passed away suddenly. I feel like I’ve lost a child. It’s been a rough few weeks and I’m still not completely over it, but they say that time heals all wounds. So this project has been pushed back a bit. I have a lot of homework to do, in the form of studying the distribution process, before I can begin to ask distributors the right questions. But I’m looking forward to the challenge. Distribution is one of toughest and important challenges that producers face. Shoom Zone Productions now has a Facebook page! So how about giving my page some love by hitting the “Like” button? This blog is going to be getting busier in the future because there is a bunch of news that needs to be announced, so stay tuned! 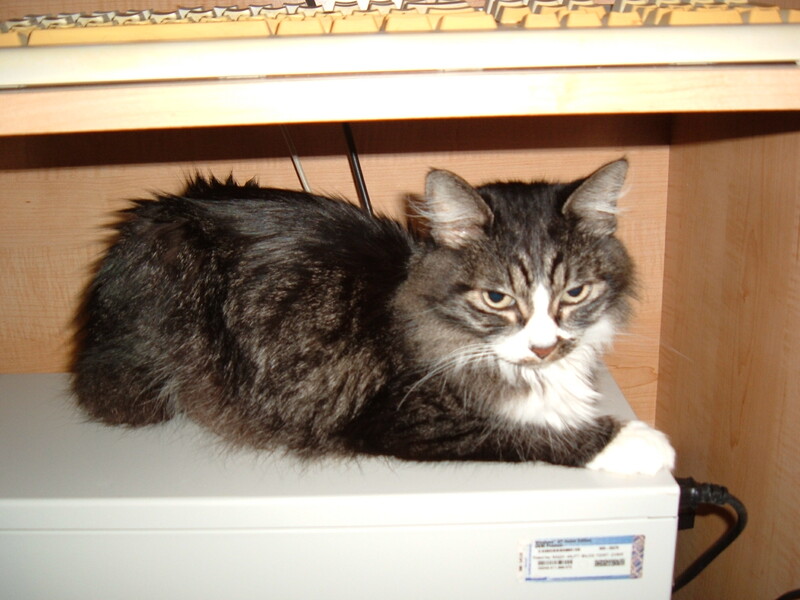 Leila 2000 - 9/25/10. Taken from me too soon. I miss my sweet little girl. A Stranger From the Outside! 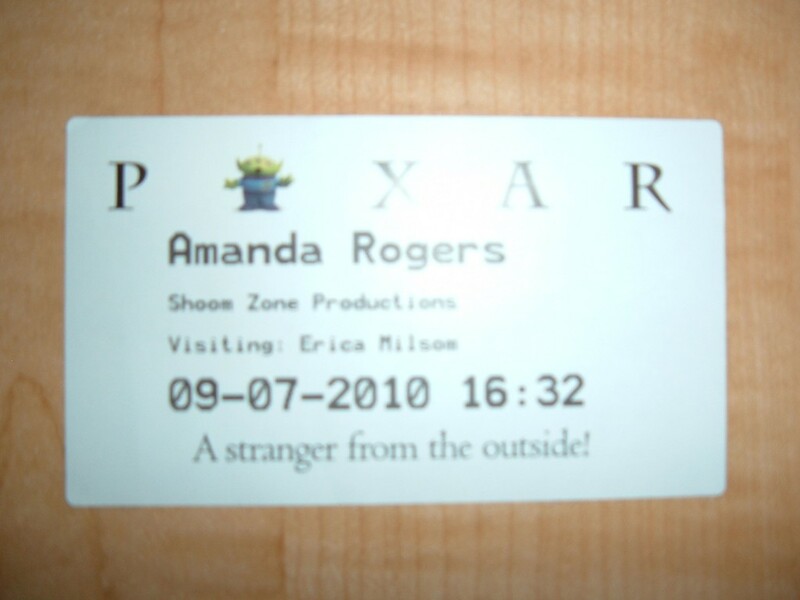 Last month I visited Pixar studios in Emeryville for the first time. It was a rare opportunity to see both the studio and Geena Davis, who was speaking there on the subject of women in the media. The event was sponsored by Bay Area Women in Film & Media (BAWIFM). I’m a huge admirer of Pixar. The fact that every film they make hits it out of the ballpark just blows me away, so I jumped at the chance to visit this remarkable studio in person. Security is pretty tight at the studio. You better have an appointment and/or be on their visitor list to get in. They don’t offer tours to the public. Once inside the gate you are directed to the large parking lot. After parking, I and several others ended up having to wait around outside the building for the doors to unlock. Once inside we were given our visitor badges. The funny thing about those badges is that we were not called visitors. Instead we were designated as strangers from the outside! Check out the picture below. Once inside we had to wait for quite a while in the massive lobby, called the atrium, for the theater to open. But, as usual, BAWIFM took good care of us and offered us drinks while we were waiting. I ran into a couple of people that I had met before and I met a few new people also, which is always my goal at any kind of networking event. I am so kicking myself that I didn’t bring a camera with me. I could have shown you some pretty cool pictures. The lobby is huge. There’s a cafeteria on one side and on the other a mail room, a store (that was unfortunately closed), and a game room for employees. Life-size figures of various characters from the Pixar movies are sprinkled throughout such as the monsters from Monsters, Inc., the cars from Cars, and the family from The Incredibles. There was a big giant chair in one corner which you could actually climb up on and get your picture taken. Another photo opportunity was the action figure package that was big enough for a person to get into and pretend to be an action figure. Before you hate me too much for not taking pictures, let me point you to The Pixar Blog where you can see photos of the studio for yourself. The blogger who toured the studio was able to get some great photos of both the inside and outside of the studio. Check out the rest of the blog too. It’s a great blog for everything Pixar! And for even more photos check out Collider.com for even more fantastic photos taken on press day. After what seemed like a long wait, we were finally admitted into the theater. I got a great seat in the second row with a great view. However, I didn’t even notice Geena sitting in the first row until she was announced. What struck me about her was how tall she is. She is about 6 feet tall according to IMDb, but with heels on she easily stood around 6’3″. She’s stunning. I would have never known she was 54 if I hadn’t looked it up. She could easily pass for her late thirties. Geena immediately put the audience at ease with her graciousness, humor, and intelligence (she is a member of Mensa). Geena’s purpose that evening was to talk to us diverse group of film people about the roles of women in the media, specifically, the number of females in children’s programs and how they are portrayed. Geena’s quest started about six years ago when she noticed an imbalance in the ratio of male to female characters while watching TV programs and videos with her young daughter. This caused her to undertake a research project about gender in children’s programs and to later start the Geena Davis Institute on Gender in Media. Her goal is to make the entertainment industry more aware of not only the number of females in children’s entertainment but, also, how females are portrayed. This means showing female characters that have aspirations beyond romance and are valued for their inner qualities as opposed to just being valued for their looks. I wish I had videotaped her speech that night, but here is a recent interview of Geena by Sir David Frost that you can watch that gives a shortened version of what she talked about that night. Gloria Stuart passed away on September 26 at the age of 100. She’s probably best known for her role in Titanic. However, I-Man fans will always remember her for her role as Madeline Fawkes, Darien Fawkes’ grandmother, in The Invisible Man. Mike McCafferty gives us a bit of insider insight into what it was like to work with Gloria on his blog Acting Guy Talking About Acting. And, last but not least, you can watch the I-Man episode that Gloria appeared in entitled “Father Figure” below.